When Dave was a kid, like most 12-year-olds he decided he wanted a dog. What he had in mind was a good-sized companionable creature, the kind that races behind your bike, ears laid back by the wind, tongue lolling, that goes fishing and swimming with you, that lies by your feet at night while you watch TV. What he got was the runt-of-the-litter beagle puppy supplied by a fellow who worked for his Dad. The puppy was of a good line, registered parents and all that, but as far as I remember we never got any papers on him. All we wanted was a household pet. He was an adorable little guy, long, floppy ears, liquid brown eyes and a little tail that stood straight up with a white tip on the end. He was friendly, eager to please and he had one all-consuming passion in his life.......to get his own way. And his way was the highway. As Lizza posted on her wall this week, "Cause I'm a ramblin' man, I ain't ever gonna change." He was not very old before our backyard began to resemble a war zone. It was enclosed with redwood fencing of the kind that was the style for California ranch houses in those days. Barney ate through redwood fences like they were rye crackers. We plugged the holes with concrete blocks. He dug under the fence. We made barricades of rebar stakes. He pushed them aside. We strung chickenwire. He climbed over it. We would often spend an afternoon repairing the holes in the fence, pounding in the stakes and stringing the wire, then while enjoying a glass of water at the kitchen sink after our exertions, we would glance out the window and there he would be, trotting down the driveway. I became accustomed to phone calls from the school which was in the next block: "Mrs. Hagberg, will you please come and get Barney? The children are trying to play field hockey and he keeps stealing the puck." He was picked up now and then by Animal Control Officers and one or the other of us would have to go down and bail him out. (He was not quite such a regular as my nephew's dog, Eagle, who was said to have his own quarters at the local pound.) Several times he came home with warning notes tucked under his collar. 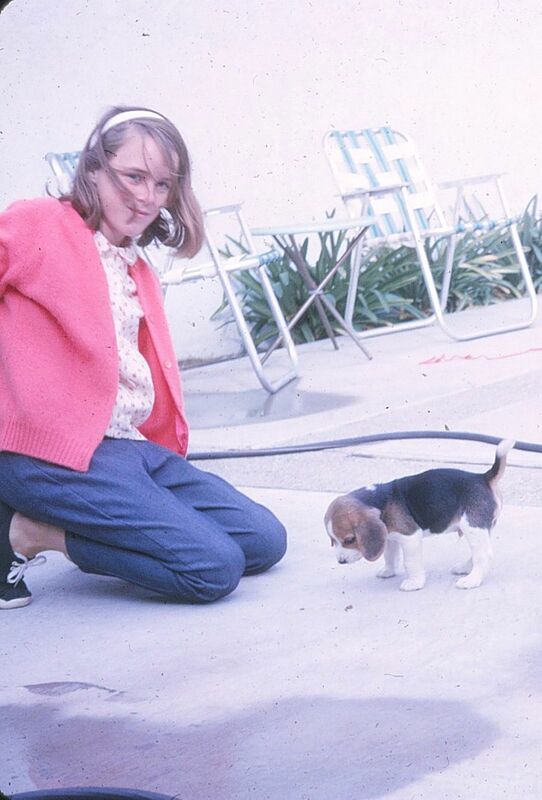 His instincts were all beagle and I'm sure his Mama would have been proud. Once when he was still very young, I saw him pointing, tail and nose in a straight line, one leg raised, still as a statue. I am not sure what he had spotted. A robin, maybe. One time he brought home a half-grown chicken, held tenderly in his jaws while the thing screeched and squawked. But mostly, he just wanted to roam free. He loved treats. A bit of left-over chicken from the dinner table or a Milk Bone would set those dark eyes dancing and the tail to wagging. He sometimes bayed at the moon, and most summer evenings he held long conversations with the neighbor dogs, no doubt discussing the state of the human condition. He seemed not to have an enemy in the world, so trusting and friendly was he. As a watchdog, he was worse than useless. He slept in a bed in the front hall and we figured the only threat he would ever present to a burglar is if the man should stumble over him in the dark. He got along well with the resident cats. At the local kennel, where he sometimes stayed when we were traveling, he was kept in the kitchen with the family, instead of the boarding kennels outside. He was lovable, irritating, irreplaceable. I like dogs OK but I am not a "dog-lover". But, of course, this dog worked his way into my heart. One time we returned from a trip to Europe and picked him up from the kennel. He was barely walking and his beautiful brown eyes were glazed with pain. We called the kennel owner and the vet and were assured that there was nothing to be done but to end his suffering. He was 12 years old. Rest in peace, little pest. A word of warning to new dog owners: Do not get a beagle unless you live on the moors or the open prairies. They are charming and loving and beautiful to look at, but they are not meant for suburban lots. They need SPACE and lots of it, to roam and run and chase things and to breathe free. This was a fitting tribute! Thanks Mom.